Though he’s getting full of days, he’s still got every bit of his wits about him, and was, as expected, a font of knowledge. I was working for Randy Murray, of Randy Murray Productions in Phoenix, who for the past 9 years has been putting together a documentary about Sheriff Joe Arpaio called The Joe Show. Here’s the trailer. You need to watch it, this stuff is seriously amazing. And not in a good way. The trailer just hints at his gross disregard for common decency; you really need to see the movie when it comes out. It’s shocking that someone like this is not in jail several times over. Yet the public keeps re-electing him. 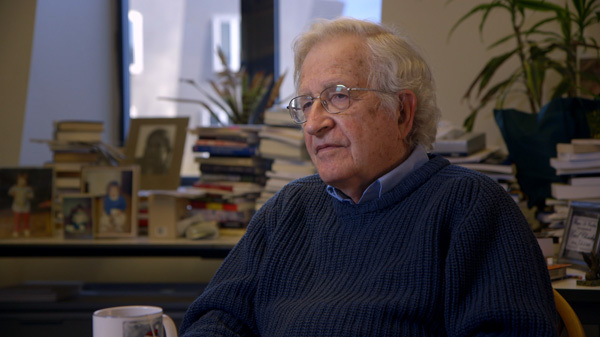 People like Noam Chomsky are very hard to shoot, b/c their time is extremely limited, and they don’t really care if they look good. So we had to pre-light the whole scene with stand-ins, and when he was ready, any time we took tweaking the lighting setup was time taken away from the interview. Given that, we opted for a softer setup, so he could turn to the left or right a bit, and there was no risk of weird shadows popping up. Soft light also has the benefit of minimizing wrinkles, so we knew it would be flattering too. The key light is my trusty Kino Diva 4-bank, set to full and daylight balanced. We bounced a Pro-light off some foamcore to warm the side of his face up a little, and the fill light was daylight from the windows behind him and camera right. Lastly, we left one of the room flo’s on, which gave the background just a tinge of green. When the movie is about someone like Joe Arpaio, it never hurts to light things just a touch unsettling. The A-Cam was of course my trusty C300, with my GH2 on alternate angle duty. 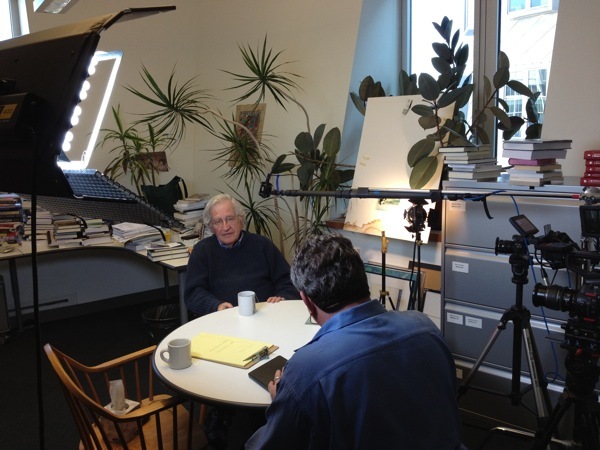 The biggest treat was a sneak preview of a really cool project Prof. Chomsky is involved in with one of my heroes. I promised I wouldn’t give away any specifics, but I’ll just say that there’ll be a screening soon in the MIT area, and you’ll definitely find me there.